– You can absolutely get all the nutrients your body needs to thrive, without consuming meat. – You can still eat meat, and be a good person and be healthy. Quinoa is the world’s most popular superfood. Not only is it packed with protein, it’s a complete protein and a fantastic wheat-free alternative. Add to that the protein in the mozarella and you’ve got yourself a powerful dish! Thanks to a good bit of cooked quinoa mixed right in, they have a bit of a fluffy consistency. And compliments of the cheese, there’s a bit of an ooey-gooey meltiness going on. The basil adds a bit of freshness and the cherry tomato not only makes me smile, but it also kind of reminds me of the middle of the cinnamon roll. The best part is in the center – and I like to save it for last. I highly recommend using both paper liners AND non-stick spray or an oil mister, otherwise you could be spending days scrubbing egg off your muffin tin. If you freeze them (and I highly recommend them for freezing! ), just place them in a single layer in a gallon size zip bag and plop them in the freezer. Then pull one or two out at a time, microwave for about a minute and a half on high, and, voila! Instant awesome breakfast. Preheat oven to 350ºF. 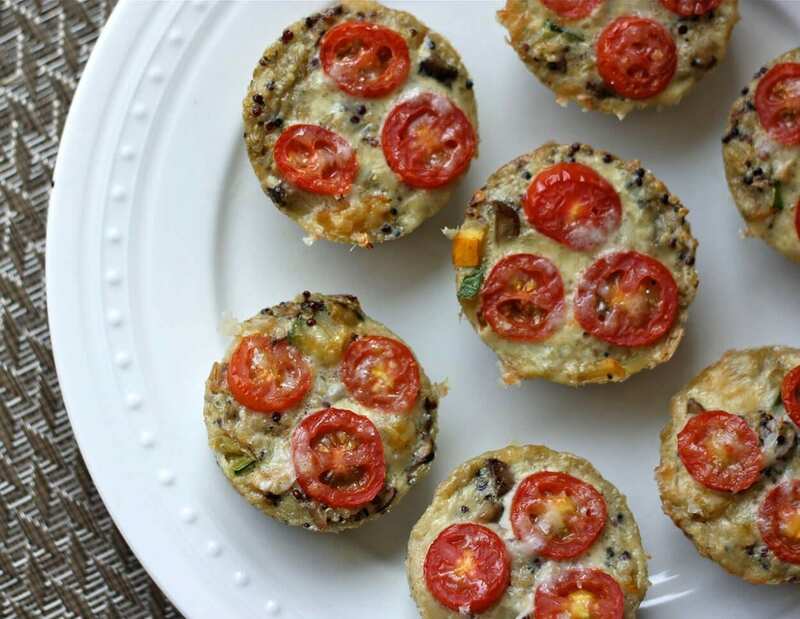 Line a 12-cup, standard-size muffin tin with liners and grease well with non-stick cooking spray or an oil mister. In a large bowl, mix together the quinoa, eggs, 1 cup mozzarella cheese, 1/4 cup Parmesan cheese, basil, onion, salt, and pepper until all ingredients are well-incorporated. Divide mixture equally between muffin tins (I use an ice cream scoop). Sprinkle each with remaining mozzarella and Parmesan cheeses. Push a cherry tomato about halfway into the top of each. Bake for about 20 minutes until egg is set and frittatas are golden around the edges. Lentils have been part of the human diet since aceramic Neolithic times, being one of the first crops domesticated in the Near East. Archeological evidence shows they were eaten 9,500 to 13,000 years ago! A rich provider of protein and carbohydrates the lentil is also a good source of calcium, phosphorus, iron and B vitamins. 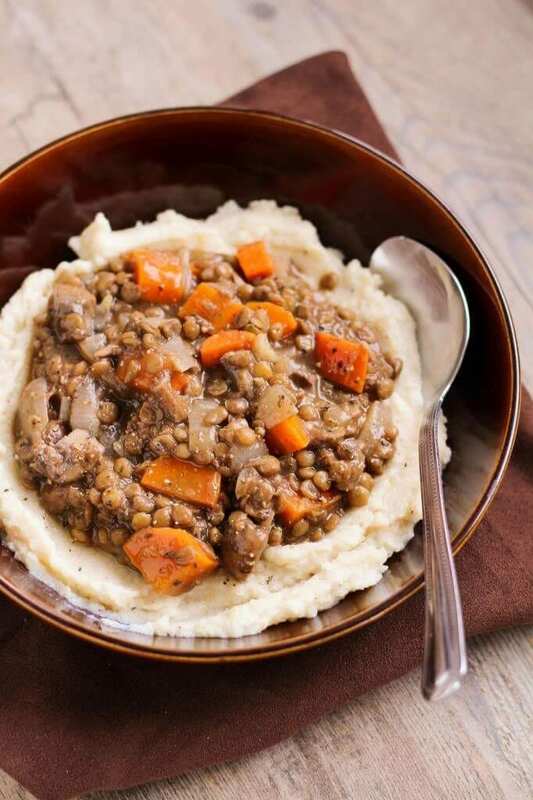 This stew is made with lentils (obviously), onion, garlic, mushrooms, carrots, vegetable broth, plenty of seasonings, and a splash of red wine for good measure. So you’re getting a ton of vitamins, fibre, and protein to fill you up and keep you energised through the day or night. I love using lentils in meals because they’re a great source of protein, they’re easy to cook, and they’re really cheap! And to make this even more of a protein power bowl, I pureed white beans with cauliflower to serve as the base for the stew. Steaming and pureeing cauliflower is one of my favourite ways to eat it and I honestly like it even better than regular mashed potatoes. Sometimes I’ll puree cauliflower with chickpeas or white beans and some flavourful mustard and just eat that for dinner on its own, but it goes even better with a hearty stew on top! Meanwhile, in a separate large saucepan or dutch oven, heat olive oil over medium heat. Add mushrooms, carrots, onion, garlic, and dry seasonings (cumin through thyme), stir, and let cook for around 5-7 minutes, stirring often. Add tomato paste, stir to coat, and let cook for about a minute. Add cornstarch, stir to coat, and cook for another minute. Add red wine and let simmer for about 3 minutes. Add vegetable broth and bay leaves and lower heat to a simmer. Add lentils and let simmer for at least 5 minutes. Remove bay leaves, stir in Worcestershire sauce, and season to taste with salt and pepper. Protein in the Quinoa and protein in the cashew cream make this delicious dish a brilliant meat alternative. I just adore quinoa; it’s good for you, easy to cook with, and it’s downright tasty. Quinoa is such a versatile ingredient that no pantry is really complete without it. Quinoa can be milled into flour for gluten-free baking, baked up into big batches of crispy granola, or formed into delectable little cakes like these. 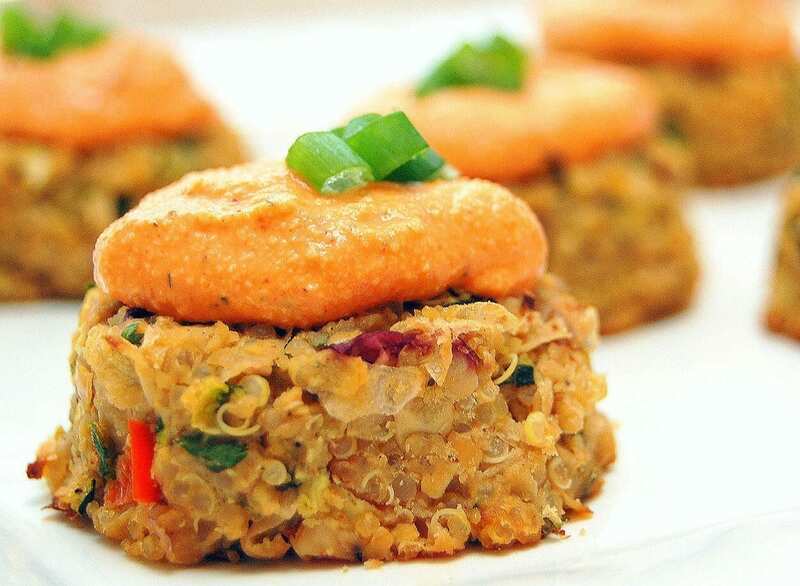 I have served these cakes on gluten-free buns like burgers and simply on their own as a main dish with a side of roasted veggies. Either way they are delicious! Make about 1 cup of dried quinoa according to package instructions to get 2 1/2 cups cooked. I cook my patties in a cast iron skillet on medium-low. If you see that your patties are not browning after the first side has cooked for 10 minutes crank up the heat on your stove a bit and continue to cook the patties until they are browned. You can serve these Crispy Quinoa Cakes with a number of different sauces; if you’re short on time, a good jarred marinara will definitely work, but I love using this Roasted Red Pepper Cashew Cream. If you have leftovers, it makes a tasty veggie dip or sandwich spread! In a large bowl combine the quinoa, eggs, and salt; stir to mix well. Add the basil, red onion, cheese, garlic, and breadcrumbs to the bowl; stir, then let the mixture sit for a few minutes so that the bread crumbs can absorb some of the moisture. If your mixture is too wet you can add a little more breadcrumbs at this point and if it is too dry add a small amount of water. Heat a tablespoon of olive oil or clarified butter in a large, heavy skillet over medium-low heat. Form the mixture into 12 small patties; when the oil is hot place enough patties in the skillet so that it is full, but the patties still have room in between them. Cover, and cook for 7-10 minutes, until the bottoms are crisp and deeply browned. Carefully flip the patties with a spatula and cook the second side for about 7 minutes more. At The School of Natural Health Sciences we offer a variety of online, accredited Nutritional Courses designed to help steer your career – Clinical Nutrition, Advanced Nutrition, Sports Nutrition & Child & Adolescent Nutrition. Our accumulation of diploma-correspondence courses have made us the go-to online learning facility for individuals wanting a top-class education without the usual stress and hassle schooling brings. Our passion for affordable health education has allowed us to continue our work since 1997, and we hold great pride for each and every one of our students. Read their testimonials here. For any enquiries, don’t hesitate to contact us, we’d be delighted to hear from you! We can even send you course sample pages, so you can see what our lessons entail.